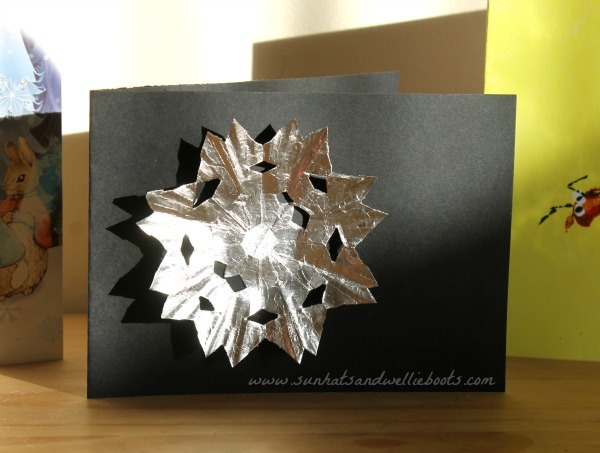 These shiny snowflake cards make beautiful thank you notes for kids to send at Christmas. 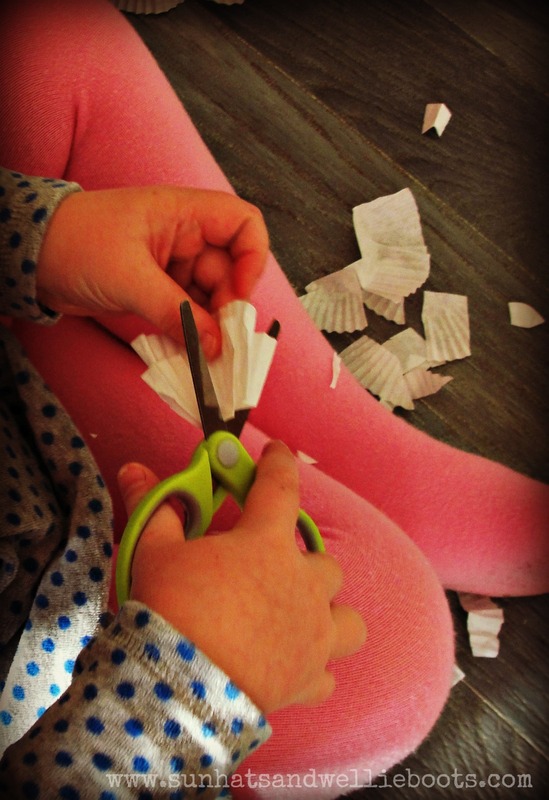 Thrifty, & easy for all ages to create, they're a great quick activity for the holidays. 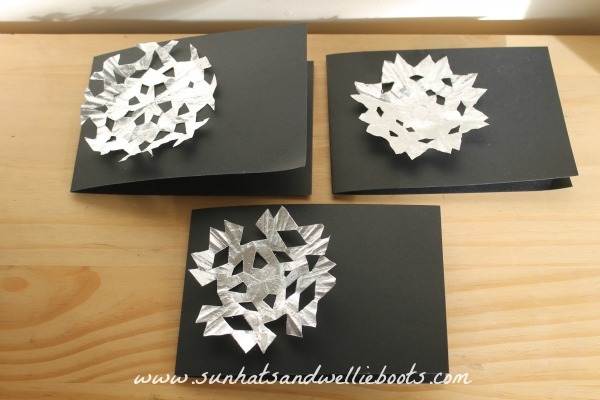 To create an icy winter feel we used silver foil cupcake cases to make our snowflakes. I don't know about you but I always find a few flat cupcake cases that have disappeared to the back of the kitchen cupboard, & this activity is a neat way to make use of them. 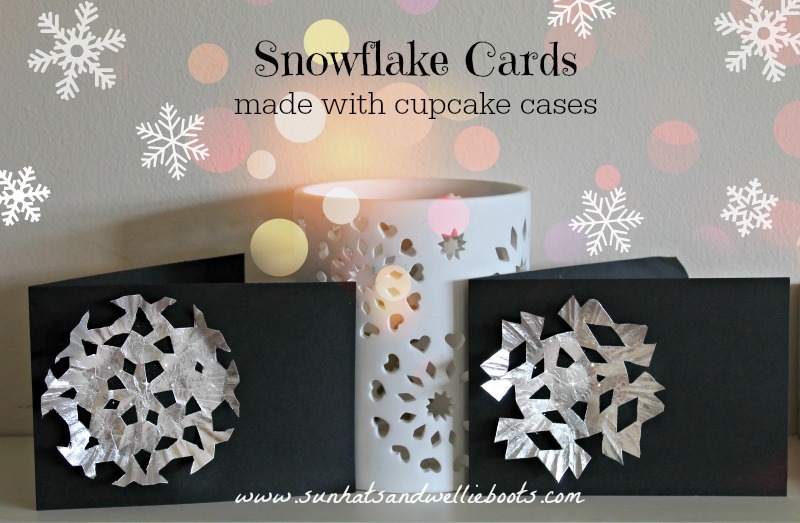 To make the snowflakes just flatten out the cupcake case & then fold in half & half again. You can keep folding which will give you a more intricate pattern, but we found the more the paper case was folded the harder it was for smaller hands to cut. Just like real snowflakes these paper creations can each be different & unique in their design. To create the patterns just cut out small shapes along the edges, making sure there is a little paper left between each section. Small triangular shapes are easy for young children to cut independently, & they make beautiful patterns too. 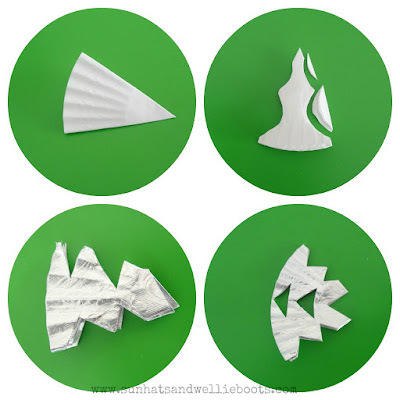 You can encourage children to be as creative as they wish with this activity & invite them to experiment by folding the paper in different ways, & cutting different shapes & sizes. They can explore symmetrical patterns & have fun predicting what shape or pattern they've created as they unfold their cut snowflake. Once you've unfolded your snowflakes they can be glued onto a piece of folded card, we chose black as it really made the silver snowflakes stand out. If you add a small dab of glue to the centre of your snowflake to secure it to the card, the remaining snowflake will stand away from the card to create a shadow effect. 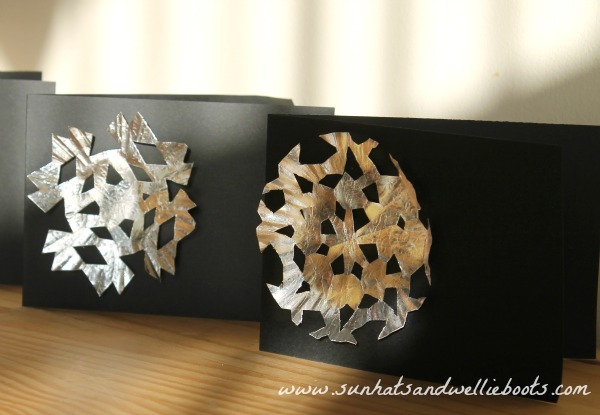 The foil snowflakes really catch the light & create a pretty pattern on the card behind. If you wish you could add glitter or sequins to make the snowflakes even more sparkly. I love that these homemade cards can be prepared & created quickly. We cut the cards to A5 size so they were fairly small which meant less room to fill with writing. Writing thank you cards is never an easy job, so when there's less space to use it's even better, Minnie was recently given a set of white & silver pens so is eager to try them out on these cards. If you don't have pens that will show up on dark card, cut a small square of white paper & stick it the centre of the card. I know if I were to receive a homemade thank you card like this it would certainly brighten my day, & it's a beautiful card to have on display throughout Winter too.